Today’s Macs are miracles of speed and efficiency, but there are particular tasks that can take seemingly forever. One of those tasks is encoding and converting video. A couple of years ago, Elgato offered a tool to help strip some time from this process in the form of its Turbo.264, a USB dongle that took over much of the burden of encoding QuickTime video. Earlier this year, Elgato released the Turbo.264’s more-powerful sibling, the Intel-only $150 Turbo.264 HD. Like the original Turbo.264, the HD model is designed to speed up video encoding. In addition, it speeds the process of converting video directly from AVCHD HD camcorders, lets you trim video clips before converting them, allows you to combine multiple clips into a single clip, and outputs video to HD formats including YouTube HD, 720p, and 1080p. And it’s faster on both slow and more-powerful Macs. The proof is in the pudding and one of the main ingredients in this pudding is how long it takes to convert video with and without the Turbo.264 HD. To find out I tested the device on both a current 2.0GHz Intel Core 2 Duo Mac mini (with 4GB of RAM) and an older 2 x 2.66GHz Dual Core Mac Pro (with 8GB of RAM and an NVIDIA GeForce 8800 GT graphics card). I performed two tests. In the first I used RipIt ( ) to convert the DVD of Harry Potter and the Order of the Phoenix to an unprotected Video_TS folder. I then converting the main feature from that folder to a single Apple TV-compatible movie with the Turbo.264 HD application. To compare its performance to an unaccelerated conversion, I used HandBrake (which doesn’t take advantage of the Turbo.H264 HD) to convert the Video_TS folder again. I also attached a Sony HDR-SR11 ( ) AVCHD to each computer and imported a 6 minute and 44 second clip. I first used the Turbo.264 HD application to import the clip and convert it to the Apple TV ( ) format. I then imported the clip using iMovie ’09 ( ) and then employed iMovie’s Share command to save the movie in the large, Apple TV-compatible format. In regard to speed, the Turbo.264 HD performed admirably in each test. In the DVD tests, the Turbo.264 HD gave a nice boost to the both the Mac mini and Mac Pro. On the mini it took 36 minutes and 13 seconds to convert the movie. The unaccelerated HandBrake performed the same job in 2 hours and 13 minutes. The Mac Pro, with its extra oomph, helped HandBrake, but not enough to best the Turbo’s performance. On that Mac the Turbo converted the movie in 35 minutes and 40 seconds. HandBrake took 57 minutes and 10 seconds. Pulling a movie clip from an AVCHD camcorder and converting it to an Apple TV-friendly format was also dramatically faster with the Turbo.264 HD. On the Mac mini, I was able to convert the test clip in 9 minutes and 29 seconds. It took iMovie ’09 10 minutes and 7 seconds just to import the clip from the camera. It took another 17 minutes and 5 seconds to export it. With the Mac Pro, importing the clip into iMovie ’09 was similarly slow—6 minutes and 28 seconds to import the clip and then 9 minutes and 36 seconds to export it. The entire job was accomplished by the Turbo.264 HD in just 5 minutes and 12 seconds on the Mac Pro. Regrettably, you pay a price for this speed—image quality. When comparing the videos created with HandBrake, iMovie, and the Turbo.264 HD application, the Turbo videos had more visible artifacts. Not jarring, “Aack, my eyes bleed!” artifacts, but noticeable if you look for them. Specifically, these were evidenced as jagged lines and video that looked a little soft. Within the Turbo.264 HD application you have the option to create custom settings to deal with this kind of thing, but it’s a problematic solution for a couple of reasons. First, some Mac users may have no idea how to effectively tweak an overscan or data rate setting (much less a more advanced setting such as H.264 Profile, GOP Size, or Picture Coding). Secondly, when you tweak those settings it’s possible that the results won’t play on the intended device—set a video’s data rate too high, for example, and an Apple TV will refuse to play it. And honestly, you shouldn’t have to go through the bother. Even more than Handbrake, the Turbo.264 HD is designed to be a plug-and-play solution. What comes out of it should be great looking video. Unfortunately, it doesn’t currently meet that standard. 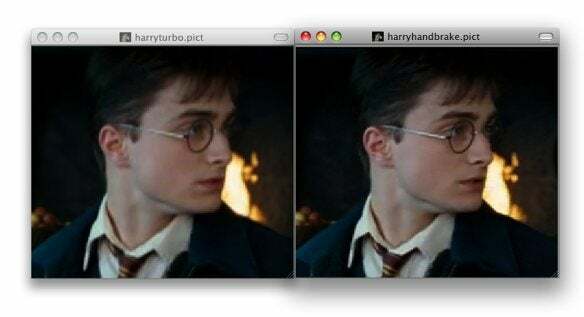 The Turbo's results (left) are less crisp than what you get from a tool such as HandBrake (right). Note that these images are blown up 2x so the quality appears worse than it is. Additionally, the Turbo.264 software wasn’t completely robust. There were times when the software failed to recognize that the dongle was plugged in—there one minute and gone the next. Plugging it back in solved the problem. And the current-as-I-write-this version, 1.0.2, got hung up when attempting to encode the Harry Potter Video_TS folder on the Mac Pro (it had no complaints on the Mac mini). Installing a beta 1.0.2+ version solved the problem. If you own an Intel Mac and routinely encode QuickTime-compatible videos or import clips from an AVCHD video camera, have just about had it with the time it takes to do the job, and are willing to sacrifice a small measure of quality, the Turbo.264 HD will be a worthwhile addition to your computing life, particularly if you’re using a slower Mac.